“How do I justify the cost of building out our mobile services?” This is a question that Forrester is fielding with increasing frequency. With offline and online revenues dwarfing the revenues derived from mobile services outside of mobile media today, consumer product and service companies must look to attribute and quantify the broader set of benefits that mobile services generate rather than simply revenues. There are three general categories of benefits: increased revenues, lower costs, and higher performance on key performance indicators driven by consumer delight with convenient services. With an emerging medium like mobile, it is difficult to forecast consumer adoption and usage — two key elements for assessing the return on investment (ROI) of mobile services. 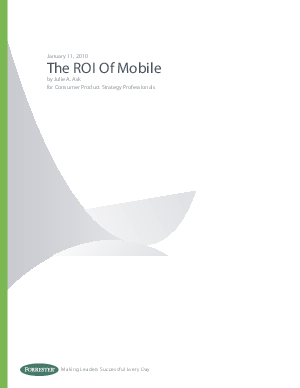 Forrester breaks down the process of calculating the ROI of your mobile initiatives into four key steps — identifying benefits, estimating the value of the benefits, calculating costs, and building a model — to help justify the resources you need for mobile without getting lost in the details.